Was ist das? 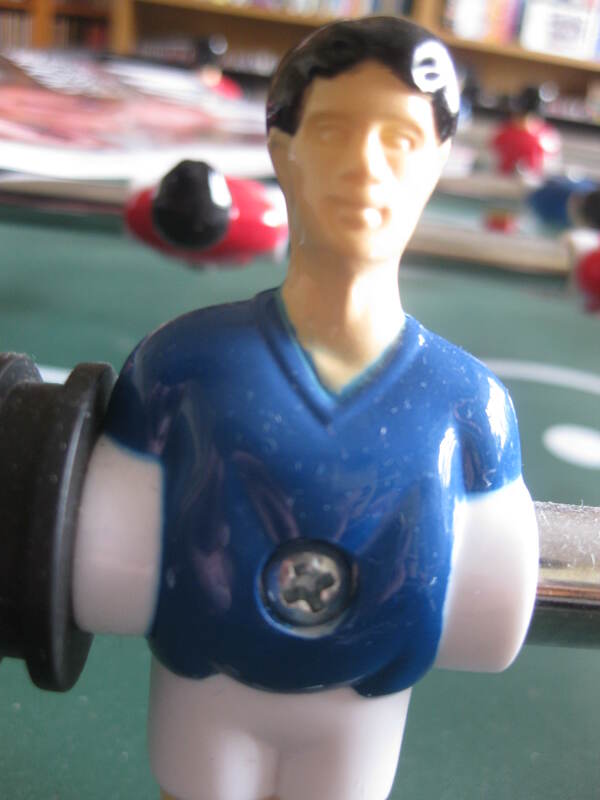 Yes, sorry to break it to you like that, readers, but Joachi Lowenbrau’s Germany were crowned Kings of Yooropa last night, after a thrilling final and a momentous climax to the Yooro 2012 table football tournament. 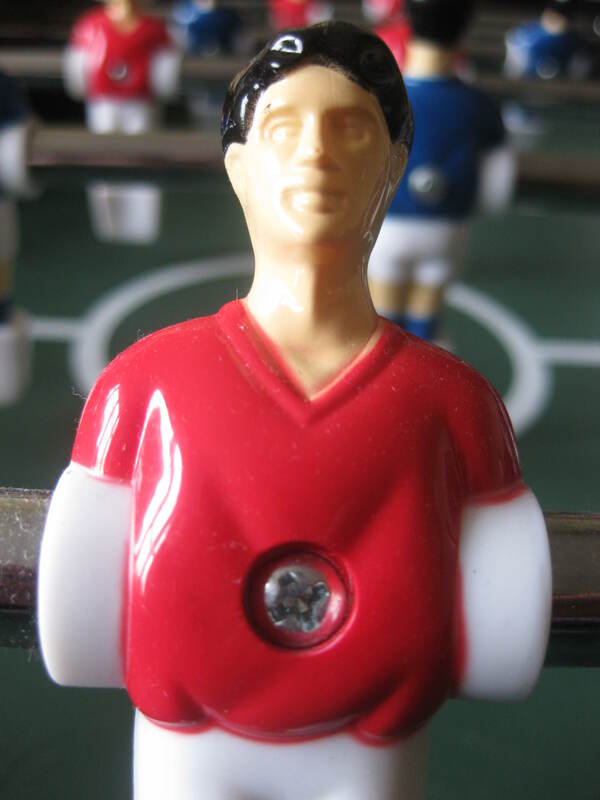 Deutschland reigned supreme in Daftown after a topsy-turvey encounter at the New Table of Dreams, the Germans getting off to a slow start and finding themselves 2-0 down before pulling their metaphorical socks up and storming into a 7-2 lead. From there, Lauren Blancmange’s French France – the form side going into this encounter – upped the ante and pulled their own proverbial chausettes up, briefly leading 8-7 before a major ding-dong, a veritable ping-pong of points and plenty of pinball-style moves led to the sides being locked at 9-9. Nerves were truly taut from that point on, but in the end Messi Ozone – who had already bagged two German goals – hit a wicked shot that took a cruel deflection off Patsy Nevra to wrong-foot the until-then unflappable French keeper Huge ‘HGV’ Laurie. It was a bitter-sweet night for the French, who did enough to secure the goalscoring award with 59 strikes across six matches, and who also boasted golden boot winner Florentine Mangetout. The Chelski star made sure of that award with a hat-trick to make him the highest goal-scorer with 14 finishes, beating off Fabi Pigherder, who scored two on the night, and Supermario Gnomez, whose own double ensured parity on 13 strikes. But ultimately it wasn’t to be the Frenchman’s night. In an emotional post-match interview with Daftown TV, Blancmange was visibly wobbly yet tried to put a brave face on his side’s defeat, saying ‘the proof is in the pudding, and unfortunately it was a Black Forest night’, in reference to his earlier war of words with Lowenbrau. The German coach previously said the French had more chance of pushing trifle up the Eiffel Tower than claiming the Harry Delawnmower trophy. Yet Joachi was full of praise for his opponents after Sunday’s final, saying France were ‘clearly not to be trifled’ with in future, adding that as a player he ‘would have gladly served Blancmange’. Tense moment: The view from a passing blimp just before kick-off. Note the poor positioning by German keeper Manny Annoyer that would ‘cost his side early doors’ according to DTV summariser Reg Hatkinson. That left Daftown TV presenter and ex-Ingerland legend Barry Spinnaker with very few pudding puns left, but he did quip that he was glad summariser and French World Cup winner Patrice Viagra ‘hadn’t desserted’ him after the match, going on to add a few more deadpan one-liners with delighted Deutscher studio guest Yogi Klingfilm. And after a staggering 510 goals over the tournament, there was plenty of drama, fantastic finishing and dynamic defending to talk about. It was also noted by high-ranking YooArthur officials Seth Blather and Michel Platypus that there were precious few cards shown, no penalties, mercifully few rod-spins, only a handful of over-enthusiastic table rocks, and little sign of the crowd trouble or technical problems expected pre-tournament. An early drama in which one goal-line sagged was quickly put right by the groundswoman and some perfectly-placed parcel tape, and while there was slight concern over rod warping (not to be confused with the famous Scottish celebrity fan and ex-Faces singer), the New Table of Dreams was deemed a great success, having clearly survived its traumatic transfer from t’other side of Wigan in a major rebuild just prior to the tournament. The garage now awaits the NTOD, but future outings are expected, and there’s already talk of the organisers entertaining Brazilians for the prestigious staging of the 2014 Fifi World Cup Finals in Daftown. Results: Group A – Poland 10 Greece 6; Russia 7 Czech Republic 10; Greece 10 Czech Republic 4; Poland 5 Russia 10; Czech Republic 6 Poland 10; Greece 6 Russia 10. Group B – Holland 10 Denmark 8; Germany 10 Portugal 5; Denmark 10 Portugal 4; Netherlands 4 Germany 10; Portugal 10 Netherlands 6; Denmark 10 Germany 8. Group C – Spain 10 Italy 4; Ireland 9 Croatia 10; Italy 10 Croatia 6; Spain 7 Ireland 10; Croatia 2 Spain 10; Italy 9 Ireland 10. Group D – France 10 England 8; Ukraine 8 Sweden 10; Ukraine 4 France 10; Sweden 7 England 10; England 7 Ukraine 10; Sweden 9 France 10. Quarter-Finals – Russia 6 Germany 10; Denmark 8 Poland 10; Ireland 10 Ukraine 7; France 10 Spain 8. Semi-finals: Germany 10 Ireland 8; Poland 3 France 10. Final: Germany 10 France 9. 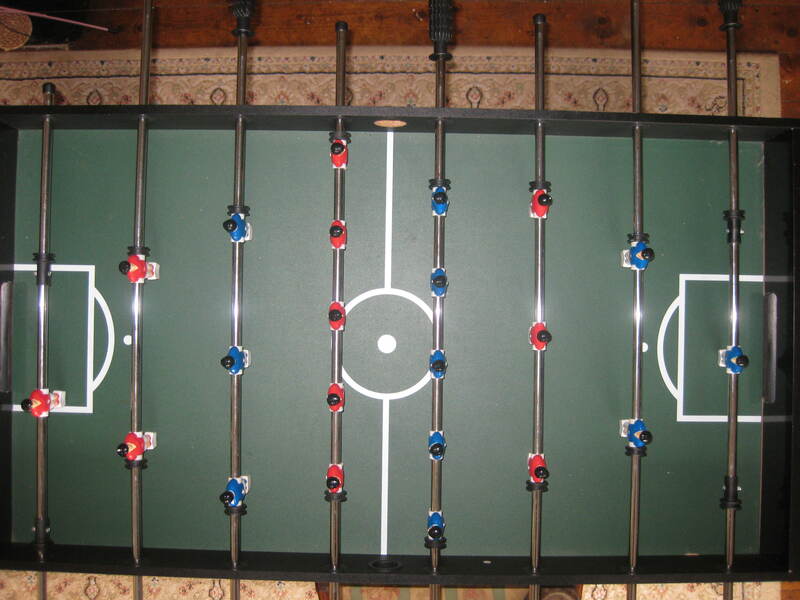 This entry was posted in sport and tagged Euro 2012, European Championships, Football, soccer, sport, table football. Bookmark the permalink.